$Signed a four-year, $32.68 million contract with the Browns in July of 2018. The only thing better than winning the Antonio Brown trade sweepstakes might be getting OBJ into the mix, and the Browns didn't have to give up any key offensive players to do so. 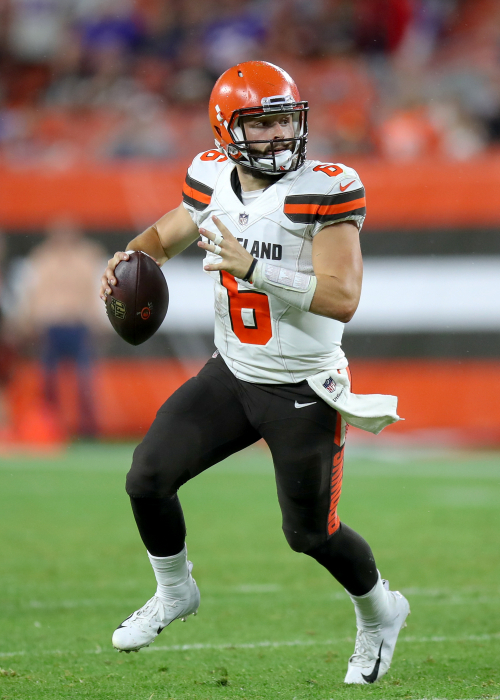 Mayfield is already coming off a nice rookie season that saw him throw for 3,725 yards and 27 touchdowns while starting 14 games. He will have a multitude of weapons heading into the new season, including wide receivers Beckham and Jarvis Landry, tight end David Njoku and running backs Nick Chubb, Duke Johnson and the newly acquired Kareem Hunt (suspension). It's a potent group that Cleveland fans may not have been able to envision just a couple of seasons ago. How do Baker Mayfield's 2018 advanced stats compare to other quarterbacks? How do Baker Mayfield's measurables compare to other quarterbacks?